While at work I was thinking about my current builds and I realised that despite hand painting camo schemes being the thing I prolly enjoy most about aircraft modelling, none of them required it. 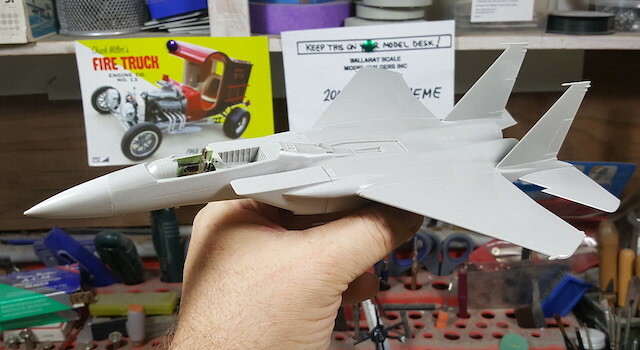 So I pulled down a Hasegawa F-15J (should be a quick build OOB) and will be painting it in a scheme based on Panther G's RAAF retro profiles. Nice! I love F-15. Can't wait to see it, especially with camo. It's funny, I was having the same thoughts today... I wanted to start a simpler build and opted for one with a four color camo scheme. Hoping for something therapeutic. ...with a white tail like this one. Sorry Mr Brad C sir, I couldn't quite get enough done to get the fuselage halves together today. There is still a few licks of paint needed on the bang seat. Please forgive me. In other news I put the wings onto the Yak 23 and the exhaust onto the Rolls Royce armoured car. Neither of these fitted particularly well. The exhaust doesn't matter because the bonnet will be closed and no-one will know (except us) but the Yak will need it's roots doing. Oversize signage on the KrAz got some small but significant PE components superglued on - 1/24 Dzus fasteners. Probably too large but I needed something to represent the fasteners holding the signs on. Sea Witch got some marlin spikes and the figurehead painted. Rotodyne 2.0 and Flying Dinghy progressed some. High Country Cougar Funny Car is almost done. Rear lights got a coat of silver paint on the rear of the red lenses and the parachute got a few coats of white. Cessna floats got white undercoat before I realised I hadn't filled the sinkmarks. So all in all a productive day at the bench. Here's a pic for Brad C.
I find it interesting that you put the bangseat in so early, Fred. It is usually one of the last items I glue in, after I've painted and detailed it. Indeed, the cockpit usually just gets a coat of paint and that's that IMO. I glued it in place because I am putting a pilot in this one and I wanted to make sure s/he fitted. Given s/he is from the Hasegawa US Pilots & Crew set I needn't have worried. S/He fits like s/he was made to be there. Which given this F-15 kit (or one based on the same mould) is used in the box art, s/he probably was. ...only to find that the decal was of black dials on a clear background. I may have to pinch the decal from the second Hasegawa F-15 in the stash. Some times I put the seat in first (Yak 23 for example - because it has complicated PE sides to it) and other times I don't. It very much depends on each kit and if I am putting in a pilot. There is nothing worse than assuming you can slot a pilot in at the end and then discovering that the cockpit opening is too narrow. Yeah buddy!! I dunno about you, but I really like the Hase kit!!!! Mine turned out great and one reason why is the kit itself. It goes together pretty well. I put filler on the sides of the nose where it was obviously needed and then shot a coat of primer over it. There are a few places where more filler is needed and I have to have a go at the join between the intakes and the fuselage with a sanding stick. I also primed the Yak 23 today. This has proved to be a die hard tail sitter. There is nowhere I could add weight where it wouldn't show and in the end I gave up trying to hide it and just filled the nose wheel bay with liquid gravity. This proved to be insufficient so I also had to pour some very thin PVA into the engine intake, slosh it about a bit and then follow it with more liquid gravity. This did the trick and I should have done it first as it has proven to be invisible without a torch. To hold it for painting I shoved a toothpick through the small transparency hole on the spine behind the cockpit. This of course split the seam. The wings are each one piece and are slightly thicker than the roots (one is slightly more slightly thicker than the other) meaning filler will be needed there. This one has engraved detail and i've tried very hard not to lose too much of it. Some rescribing will be required. I finished the Cougar Funny Car today and will take some pictures once it's had a quick polish with some car wax. As this is finished it means I was allowed to get another car out from the stash and start that. This ones a Revell '57 Ford Station Wagon which will be a slammed sedan delivery with weathered flat paint. As this is finished it means I was allowed to get another car out from the stash and start that. This ones a Revell '57 Ford Station Wagon which will be a slammed sedan delivery with weathered flat paint. ALLOWED? Who did the 'allowing'? Me. I have to keep myself under some semblance of control or i'll have started everything and finished nothing. I can relate SO well to that situation!